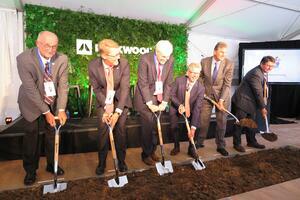 More than 120 people including Rockwool executives, government officials, and community leaders attended the ceremonial groundbreaking. With site preparations already underway, the new 460,000-square-foot manufacturing plant is being constructed on approximately 130 acres of the former Jefferson Orchards site in Ranson. When completed, about 150 people in positions ranging from management to the production line will be employed at the more than $150 million facility. 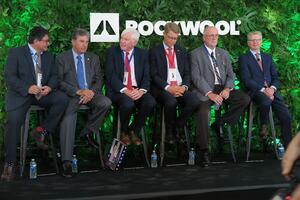 Participating in the ceremony were Trent Ogilvie, president of Rockwool North America; Jens Birgersson, president and CEO of the global Rockwool Group; U.S. Sen. Joe Manchin, D-W.Va.; Mike Hall, chief of staff to West Virginia Gov. Jim Justice; Duke Pierson, mayor of the City of Ranson; and Nicolas H. Diehl, executive director of the Jefferson County Development Authority. Rockwool officials noted the demand for its stone wool insulation products and strong market growth in the United States, along with the Eastern Panhandle's strategic location in the mid-Atlantic market, were instrumental in selecting Jefferson County for the company's expansion in the United States. "I want to be the first to say 'Hello Jefferson County'. We have really been looking forward to this day," Ogilvie said. "We are not done growing. 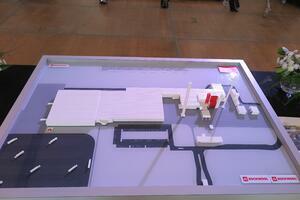 This factory is a big part of that continued growth." "This is an exciting day for Jefferson County. We are grateful that after an extensive search, Rockwool North America has chosen our county for their new plant," Diehl said. "A year ago this was a big field, waiting for a new purpose. Today, it has found a purpose, one that will build our economy for decades to come." Diehl recently toured Rockwool's manufacturing facility in Mississippi and was impressed with the operation as well as the company's community involvement, which has already begun in Jefferson County. "The state-of-the-art equipment, the cleanliness of the plant, and the focus on a safe, healthy working environment gave me confidence that Rockwool North America is exactly the kind of company we want in Jefferson County," he said. "They understand what it means to be a great community steward. We are lucky to have them." Bringing Rockwool to Ranson was a collaborative effort and Diehl recognized some of those involved including Rockwool, West Virginia Department of Commerce Development Office, Gov. Jim Justice Administration, West Virginia Department of Highways, West Virginia Department of Environmental Protection, Jefferson County Commission, City of Ranson, Charles Town Utility Board, Jefferson County Development Authority, Jefferson Utilities, Mountaineer Gas, First Energy Potomac Edison, and the Ralston Family. Construction work on the Ranson plant will proceed earnestly now with erection of the factory buildings beginning this fall, installation of the equipment planned for 2019, and production scheduled to begin in the first quarter of 2020. The facility will manufacture a full line of Rockwool stone wool insulation products, including building insulation, acoustic ceilings, and other applications. Rockwool's other North American production facilities are located in Marshall County, Mississippi, as well as Milton, Ontario and Grand Forks, British Columbia in Canada.